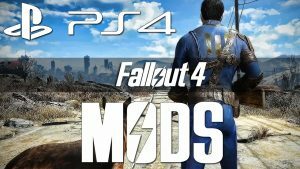 I finally got my mods for Fallout 4 on PS4! And I can only say it is about time. We, the Playstation using portion of the country, were told we would have mods late spring of 2016. The kibosh was put on that by Bethesda or Sony or both and the delay was on. I kept up in the forums for a long time but gave up checking when we moved into Q4 of 2016. Finally, early in 2017 we got mods on the PS4. I broke my copy of Fallout 4 back out and started over from the beginning. Now, the biggest question is: Why Mod? Modding can be cheating on some level and I am fine with that. I don’t mind the idea of making my gameplay much more casual on a story driven game. You get the chance to do EVERYTHING without having to spend quite as much time slogging through the resource gathering. 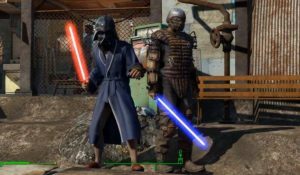 Mods can also add different aspects of the game, change the graphics and so much more. For me, this also makes the game have a new level of re-playability. Like I said, I broke my copy of the game back out immediately and started playing again from scratch with mods turned on. I wanted to experience something new and the way that the developers handle mods make it really easy. You search through the mods from the load screen and then add the ones you like. The mods are not huge in size and they dont add tot he load time. Now, I will give the same disclaimer that they give when you mod – these mods are developed by other players. They are not vetted by Sony or the folks from Bethesda. Things may break or just not work the way you intend. Anyway – mod it up! 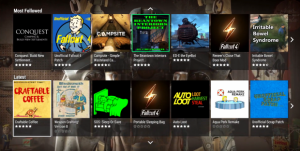 Whip out that copy of Fallout 4 and play the way that we were intended to play. Unfettered, as Darth Vader, or Buzz Lightyear – you can fly, you can fly, you can fly!